A few years ago one of my best friends got swept off her feet by an Irish filmmaker who she met at the film festival where we were working. Now she’s married, living in Ireland and they are expecting their very first child in a few short weeks. Sadly I’ve never been to visit them. I missed the wedding. I’ll miss the baby. But I’m hoping some day soon Regan and I can head over and get our fill of good friends and lovely places. 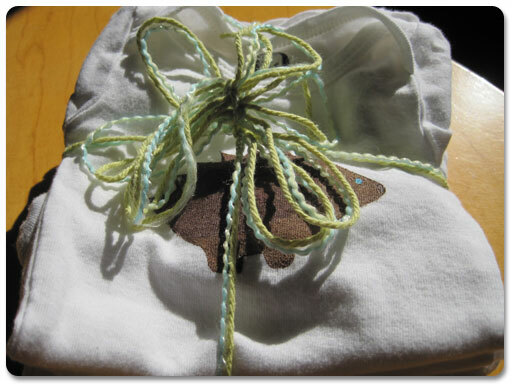 In the meantime, I’ll just make tiny clothes to send across the ocean for their new little bundle. Now I’m just looking forward to the big baby unveil so I can track down the perfect pattern for a boy or girl. Clothing for children really is just the thing for instant gratification. Anybody have a favorite pattern for baby clothing — either knitting or sewing? Too cute! Love the big green head, we can call it an alien.